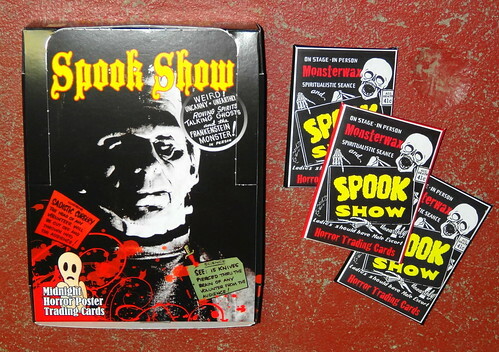 I don't remember how I first heard about the Spook Show poster trading cards from Monsterwax but I do remember ordering them as soon as I found out about them. Spook Shows are something that have fascinated me for many years. The closest I got was a showing of Monsters Crash the Pajama Party where they had "monsters" come out of the screen, run around the theater and grab a girl out of the audience and run off with her. They also handed out Faint Checks and had a lovely girl dressed as a nurse (a classy 50s style nurse, not a Halloween slutty nurse) "just in case." Ghosts! Monsters! And macabre magic! They were all part of the traveling Spook Shows. During the 1940s, 50s, and 60s, daring magicians opened movie theaters at midnight with the express purpose of "scaring the yell" out of their audience. 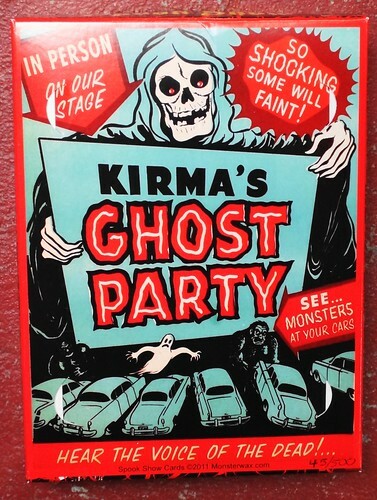 For a $1 or less, thrill seekers witnessed black magic, gruesome illusions, and the "black out"-- when glowing spirits flew overhead and the crowds ducked in terror. Then the horror flick would begin... assuming the entire audience hadn't already fled the theater in panic! 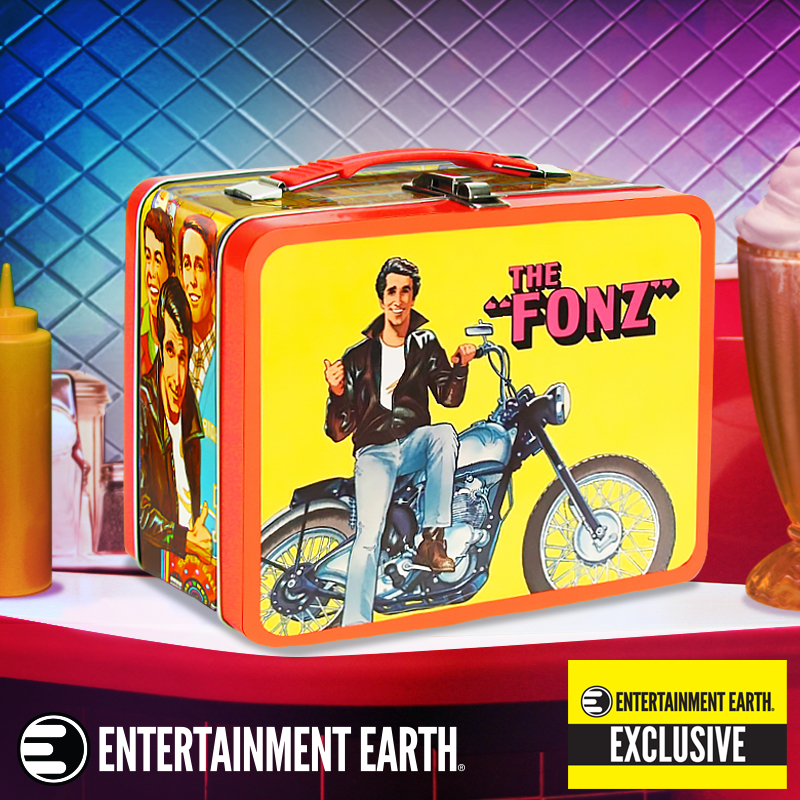 If you were among the millions who experienced this incredible fright of fancy (and especially if you didn't), then you won't want to miss the sheer horror of Spook Show-- a new series from Monsterwax. Only 500 boxes made, each is numbered in the bottom right corner. Read on to win some Spookshow cards...if you dare! What Monsterwax has done with this card set is create something really fun and informative at the same time. 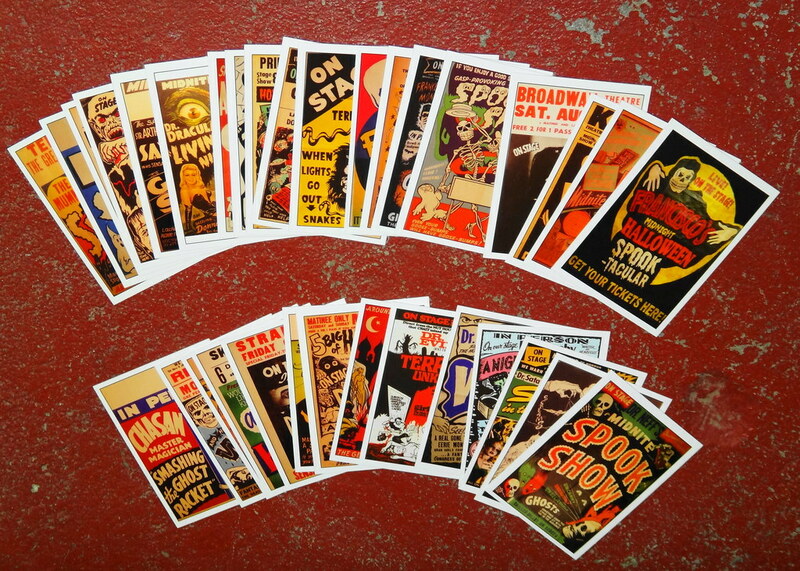 The card fronts feature wonderful show posters scaled down to trading card size. 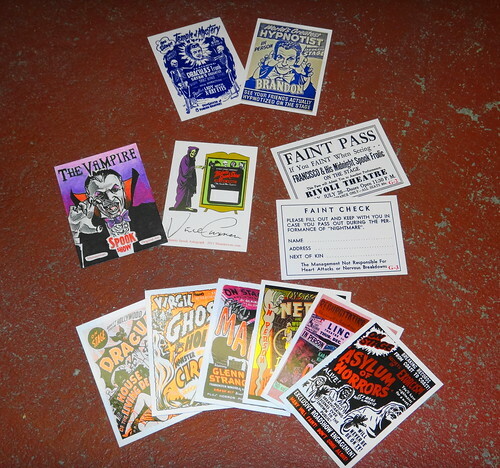 The backs of the cards are loaded with info on the "ghostmasters" that ran these shows as well as the types of gimmicks they employed to entertain the masses. The cards themselves are a nice, hefty stock and are cut a little unevenly at times. You won't really notice it unless you have a stack of cards that you're squaring up. A very minor issue with an outstanding set. At Monsterwax, they don't believe that card collectors should have to buy multiple boxes of cards to get the really cool rare chase cards. They pack a ton of stuff in each box! Not only did I get a complete base set of 66 cards, I also got (top to bottom) two embossed cards, an artist sketch card, an autograph card, gimmick cards, and 6 foil cards. 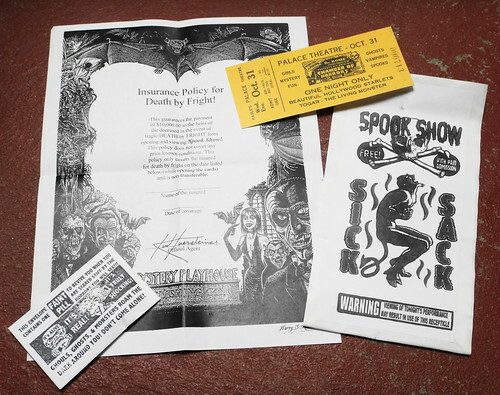 On top of that, they also packed in some extra special goodies: (L to R) a "faint pill" (Sweet Tart), a $10,000 life insurance policy in case I die of fright while opening my cards, a reproduction spook show ticket and a sick sack...just in case. You can order a box (26 packs) of cards for just $45 from Monsterwax's Spook Show page. It might sound like a lot but if you break it down, it's less than $2/pack plus the extra goodies you're getting. 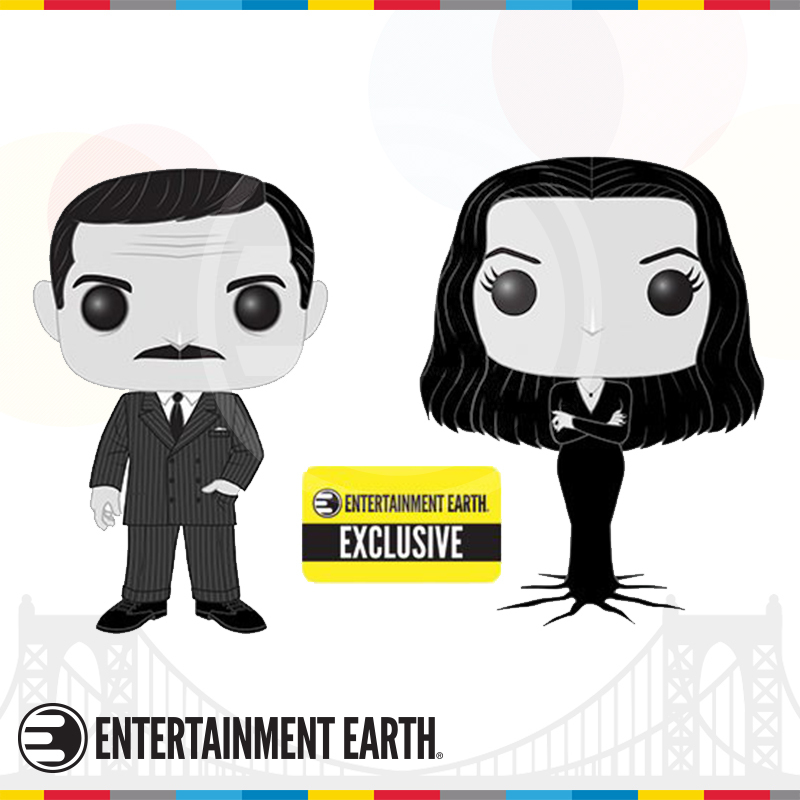 I also recommend checking out their main page as they have a variety of trading card sets including classic movie/TV monsters, the works of H.G. Wells, and urban legends. But wait! There's more! In addition to the complete 66 card base set I got in my box, I also ended up with 60 spares, not enough to make a complete set to give away to a lucky reader. But that means more people can win! I've carefully repacked the cards 6 to a wrapper (including the gum that was packed with the cards) and am giving away 9 packs of these super cool cards! The app is supposed to allow for publishing the winners but it doesn't seem to be working. So if any names show up there, please ignore them. The winners have been picked by dropping each entry into a bowl. The bowls were then laid out in a random pattern and goblins tossed into the air. The bowls that were empty after gravity did its work are the winners! I think I entered. hmm. I posted about these cards on my blog during the Countdown to Halloween. Perhaps you read about them there. Oh, my Spook Show stage name would be Monsterama2000. My name would be Dr. Brimstone! Too bad I reside in Japan or I'd be all over this. Good luck to one and all. @Erick: That may be and if so, thank you! I have been coveting these cards since before Hexxmas!! Thanks for the chance to win such killer schwag! My chosen stage name besides Creepy Glowbugg would have to be "The Argyle Gargoyle".